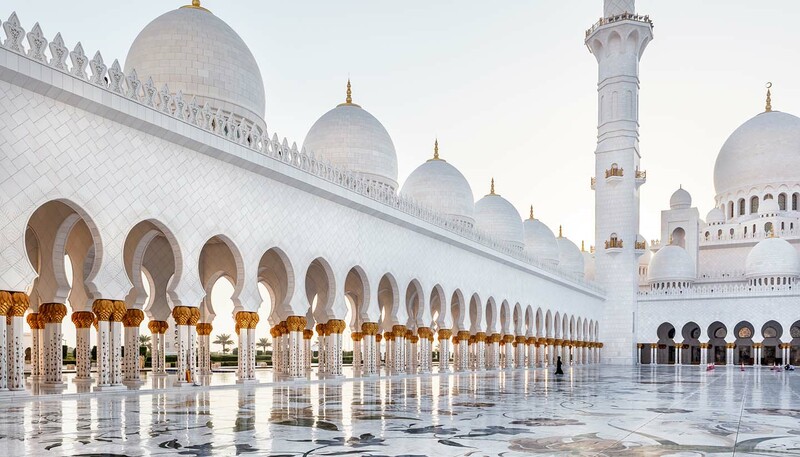 The capital of the United Arab Emirates has always been more conservative than neighbouring Dubai but what Abu Dhabi lacks in glamour, it more than makes up for in culture. That’s not to say the home of the world’s wealthiest Grand Prix is no stranger to glitz. The city boasts a slew of glittering malls, hotels and nightclubs that are equal with anything found in Dubai. – if it’s not the engineering marvel that is Capital Gate (the world’s farthest leaning man-made tower according to Guinness World Records), it’s Ferrari World, home to the fastest rollercoaster on Earth. International hotel chains have quickly taken notice and Westin, Rocco Forte and Hyatt are all represented in the capital. Another headline-grabbing development in the emirate is Saadiyat Island, which was a deserted no man’s land a few years ago. Now it’s full of resorts and beach clubs, and is where Abu Dhabi’s sun-loving set make the most of the pristine white sands. The same island is also home to another impressive new development, a cultural district that includes the newly opened Louvre Abu Dhabi, designed by French architect Jean Nouvel. A Middle Eastern version of the Guggenheim Museum, complete with thousands of works of contemporary art, will follow shortly. But Abu Dhabi isn’t just about finding ways to turn petrodollars into buildings or entertainment hubs like Yas Island, the home of the Grand Prix. The centre is home to some of the most beautiful mosques in the Gulf as well as a (very) small old town and a sprinkling of dusty homes that hint at Abu Dhabi’s desert-trader past. The picturesque corniche, with its family-friendly beaches and long promenade, is also worth a visit although you won’t entirely escape all signs of oil money. This is, after all, the home of the infamously pricey Emirates Palace Hotel, with its gold vending machines and gold-leaf flecked cappuccinos. Abu Dhabi might be relatively restrained compared to its neighbour but it still can’t resist a bit of bling.